Having survived the cataclysmic battle of Sekigahara, which established the mighty Tokugawa Shogunate, young Musashi Miyamoto travels through Japan determined to proclaim his revolutionary epiphany that the "way of the sword," the ancient code that binds samurai to their masters, needs to be abolished. But during the battle Musashi insulted an adept of the powerful Yoshioka School, and a price has been put on his head. Musashi is drawn to Kyoto, domain of the Yoshioka, driven by anger and certain he will deal a crushing blow to the traditional samurai dogma by destroying the school. Musashi will learn however, that the capital of the nation is rife with intrigue and potential rebellion against the newly established government, a struggle into which he unwittingly enters. Amongs other outcasts, Musashi will find the worth of his spectacular skill with the sword weighted against the deep cunning of manipulative Lords, and must make his reckoning with the Yoshioka, the way of the samurai, and ultimately his own nature. Only then will he be able to take one step closer to becoming the wise old sage who wrote The Book of Five Rings. 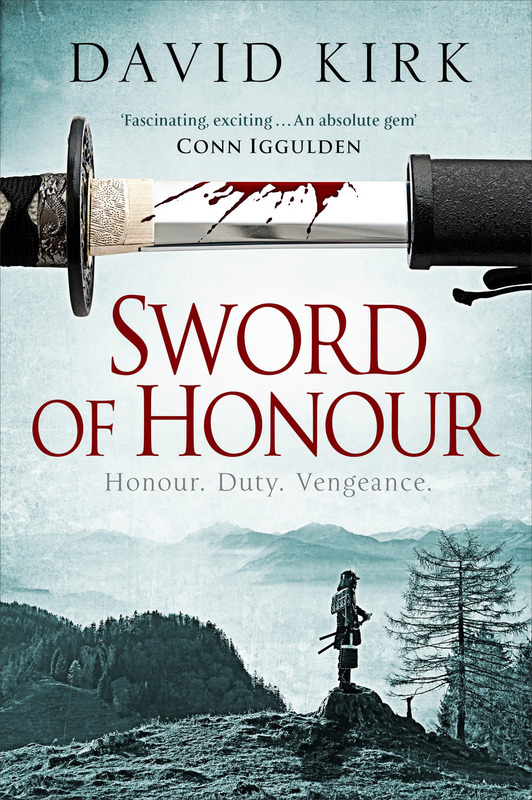 Sword of Honor seamlessly blends meticulous research, mesmerizing action sequences, and a driving narrative to bring this extraordinary figure to life. "There are lots of elements that make this novel an extraordinary read: the throat-gripping set pieces, beautiful imagery, crafty politics, and themes of ego, power, and individualism. Most of all, it is how this tale of a masterless samurai is rendered in language that feels like it’s from a different time and place—not because of archaisms or cheap tricks but because it is slow without being tedious, and it emerges from a wholly foreign worldview without being incomprehensible to the modern mind. Musashi is an unforgettable character, and this novel should make Kirk a leading name in historical fiction." "Poetic.... Kirk's vigorous and robust prose complements the action to make rousing historical and philosophical statements." "So authentic, it's easy to forget one is reading a novel...solid, action-packed, thoughtful." "Kirk has captured the essence of life in medieval Japan.... [H]e has used impeccable research to provide a story rich in historical detail.... vividly portrayed." "If one purpose of imaginative fiction is to show us that other people have different beliefs and a different understanding of morality, of what is right and wrong, then Mr. Kirk fulfills it in his first two novels. In doing so he enlarges our sense of what it is to be human—even if one response to samurai culture may still be horror, or revulsion." I began writing this novel in July 2012 and handed in the final draft in January 2015. That was about a year and a half longer than I intended. After the success and good reception to Child of Vengeance, my ambition went into overdrive and I decided I wanted to write a holistic examination of society in Kyoto in 1604 with a cast of dozens of characters, some of whom who narrated only a page or two. The initial draft was 250,000 - 300,000 words long and was sort of like Infinite Jest with swordfights. It was as confusing and bloated as that sounds, and my editors slowly talked me down. The process was frustrating, but it certainly was a useful learning experience. I still prefer the original title Hours of the Dog, and thankfully I was allowed to include it on the title page in the US edition. The calligraphy on the title page alludes to this original name - in Japanese it reads moukendo, 'The Way of the Maddened Dog'. There's a lot more historically verified incidents in this novel than in Child of Vengeance, but even so a lot of it is still fabricated. The only two things known about Akiyama, for example, is that he was called Akiyama (no first name) and that he was from the province of Tajima. He is however, the only man Musashi mentions by name as having defeated in The Book of Five Rings. Why Akiyamais afforded this 'honour' and what made him and he alone stand out amongst the more than sixty other men Musashi felled across decades is a complete mystery to historians.